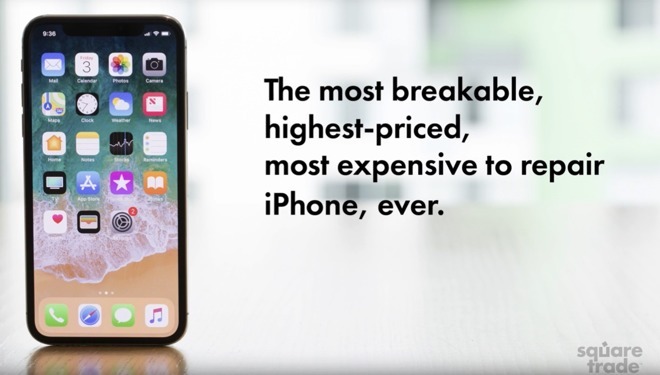 Device insurance purveyor SquareTrade calls the iPhone X the "most breakable iPhone ever" in a series of drop tests —but the assessments that the company did of the repairability differ with iFixit's teardown of the device. SquareTrade performed a series of tests, dropping the iPhone X from six feet on to what appears to be concrete. Unsurprisingly, the first drop of the device onto its face saw the glass shatter, and the Super Retina screen become unresponsive. Other angles of impact saw the iPhone X fare no better. Dropping the device onto its side or back also caused catastrophic damage to an unprotected iPhone. A "shot test," simulating the iPhone falling off the roof of a car, and a 60-second tumble in a chamber without protection of any sort also showed the expected destruction. The same video shows an iPhone X disassembly, with multiple cables being called harder to unplug, a smaller logic board harder to repair, and a "divided battery" that is harder to remove than previous models. However, a breakdown by iFixit sees no notable difference between the iPhone X and other models in these regards. SquareTrade is correct in its assessment of repair prices. Apple's own service costs are higher for the iPhone X than other models, with an out-of-warranty incident costing the user $549, and a screen replacement without AppleCare+ selling for $279. The iPhone 4, with front and back glass, had similar destruction from six-foot drops. However, the devices sometimes remained functional, albeit with shattered glass and sometimes exposed components. A more typical drop-height while in use is between three and four feet. Both SquareTrade and iFixit have vested interest in producing repairability and damage susceptibility examinations. SquareTrade sells device accidental damage insurance, and iFixit sells parts for repair to end-users. A variety of protective cases for the iPhone X shipped alongside the device from Apple itself and myriad other vendors.